I just bought a large 300 gallon system off a friend with a 130 gallon sump. It came with the AE Tech ETSS 800 XR protein skimmer. I have no experiences with this type of skimmer, and the manufacturers website www.superskimmer.com is currently not available. All I am looking for is some literature about the skimmer. An operation manual would be great if you know where I can get a copy or just download a PDF on it. I am on vacation and spending my time reading about skimmers and trying to decide if I need a new one. I have a 90 gallon reef with refugium and an ETSS skimmer (I think). 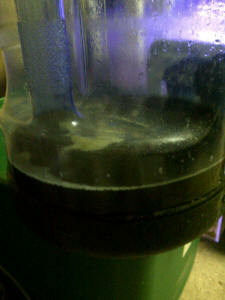 It is powered by a Mag drive 5.
then into the collection cup and it all overflows back into the sump. Also , even though I have taken apart and cleaned the Mag drive pump , most of the time it does not immediately start up and has to be physically taken out of the pump and "kicked" to restart. With regards to the skimmer itself, it is probably 7-10 yrs old. Does it have the latest/best needle/spray injection technology? I had assumed the bubbling /overflow was due to the protein skimmer working in temporarily much deeper water as opposed to the food being added as the reason. not true? Hey James(Salty) and the rest of the wwm crew. 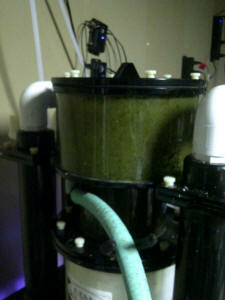 Here's some pics of the ETSS 1800 XR skimmer after about 1 week running on my 300g display w/180g sump. The first 2 pics are just showing the skimmer. The 3rd pic is the skimmate inside a 5g water bottle. Boy does it stink! The skimmer drain hose has nasty smelling air pumping out of it at all times. I would definitely recommend this skimmer to anyone. Its such a simple design yet so powerful. I have it running off of my return pump (ReeFlo hammerhead) so no need for another pump which is a bonus!! Thanks for the help. I originally replied to the original thread, but my pics were far too large so when I re-replied(lol), I just sent the pics in. I originally had questions about adding a 180g sump onto my 300g display to which you told me just to fire it up as long as the water param.s were in check between the two tanks. I have had it going for a few weeks now, and those pics I just sent were from about 1.5 weeks into everything running together(including the skimmer). I'd say the skimmer is doing its job well. I probably have almost a gallon and a half of skimmate in the water jug so far. Thanks for the help. We met at MACNA in Atlantic City. I never knew there was an Acropolis in the United States!!!! I'll have to make the pilgrimage one day. I'm so glad that you're so approachable and friendly. Your wealth of knowledge in the hobby is unsurpassed with a willingness to share with all. Five months ago I set up a 150 gallon sps/clam tank. Each of the 2 overflows drains to its' own dedicated sump. One is a refugium and one is a Rubbermaid tub that feeds the skimmer. The skimmer tub is plumbed to the refugium, which holds a lower water level due to the return pump pulling only from the refugium at a much faster rate than the Rubbermaid tub can flow through. This way, I don't directly skim anything living in the refugium, which has approximately 25 pounds of live rock and ball of Chaetomorpha. My skimmer (an ETSS Evolution 500) is externally plumbed into the garage. Powering the skimmer is an Iwaki 20rlt. disgusting foam, yet my remote gallon of milk waste container usually has taken 3 weeks to fill. I did my routine 15% water change Sunday morning and have added no new livestock, yet for some reason it has been filling my remote container twice as fast for the last few days. I started a zooplankton supplement for my sps corals, yet that was over a month ago. I have what I consider to be a heavily stocked system: 1 Yellow Tang, 1 Achilles Tang, 1 Red Sea Desjardini Tang, 1 maroon clown with Bubble Tip anemone, 1 six line wrasse, 5 Chromis, 2 lyretail Anthias, 1 Royal Gramma and a blue devil damsel. I do feed heavily (3 frozen cubes of mysis and Formula 1 twice per day and half a sheet of Nori every other day) yet have seen no ill effects. In fact, my Chaetomorpha has actually began receding from what I assume to be a nutrient poor system. I have approximately 120 pounds of live rock in the display, as I feel more swimming room for fish and growth room for corals will make for a better long term environment and higher volume of water. My question is... even though Chaetomorpha is receding and parameters seem ok, I'm noticing that a greenish film is developing on my front display pane daily. Is something going astray which I am not aware? My skimmer is rated for a 250 gallon aquarium. 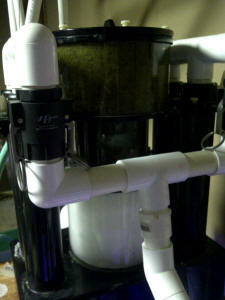 Could it be possible that I need a higher flow rate skimmer; a bigger one? I love the fact that this countercurrent downdraft consumes a mere 45 watts for what it's pulling. Could the need for a bigger skimmer be in my future. Thanks. <I'd do the following: Add to your maintenance schedule, the taking of the ETSS off line, and diluted bleach soak, rinse it to remove "bio films" every three months or so... and start adding ten, twenty pounds of new/fresh live rock to bolster the biodiversity of your system period. As always...you're a scholar and a gentleman. Thank you. I have an old ETSS skimmer labeled only as an Environmental Tower Super Skimmer with no model number. I believe it to be comparable to the 600 from the pics I've seen. The only difference is my collection cup attachment plates are square instead of round. The problem I have is that I believe the barb fitting for the injector was wrong. It was a 3/8 or 1/2" barb. When I powered on my Iwaki 55 it would immediately overflow the cup with nearly bubble-less water. I since changed it to a 1/4" barb and it seems to have corrected the problem. I can now run the outflow valve set at about 1/2 and get a dry foam to the cup. I have also added 2 bio balls to the tower because they seemed to be too far down the tower when I got it. The balls now sit about 2-3 inches below the barb. I wondered if I am moving in the right direction or if I'm hurting the performance of my skimmer. The reason I ask is that I've never seen one running before and the reaction chamber seems to have more water in it than I think it should. There is about 2 inches of turbulent water and bubble mix at the bottom of it, then solid white bubble filled from there up......I didn't think I should see water at all if it is performing at it's peak. should it be all bubbles? I was also thinking of buying a few threaded plugs and drilling them with varying sized bits and pattern of holes (like three 1/8" holes pointing towards the center) to get the most out of the skimmer. Do you think that is worth experimenting with? The skimmer described sounds like an older Reef Devil model, about 1/3 the size of an ETSS 600. Follow the instructions for the current Reef Devil, available on our web under support, to get it to run properly. The Iwaki 55 is way too much pump, this skimmer only uses 700-900 GPH Powerheads, 8 Mini 1" Bioballs.